WILLIAMSBURG, Va. (AP) -- In 18th-century Virginia, beer for breakfast wasn't a matter of college boys on a binge. It was everyday life for working people. But before you imagine folks in knee britches and tricorn hats having drunken fun in the morning sun, let Frank Clark set the record straight. "Water was often unsafe, because it was contaminated," said Clark, historic foodways supervisor for Colonial Williamsburg. "So for most people, the everyday beverage was beer or cider. It was for breakfast, lunch and dinner." This fall, Clark leads an occasional program called "The Art and Mysteries of Brewing" which takes place at the Governor's Palace scullery. There, interpreters demonstrate early brewing techniques and talk about the place of beer in colonial society. Because Clark has a personal as well as professional interest in beer, he brings an extra measure of enthusiasm to his work. He's not just demonstrating brewing techniques, he's actually making 18th century-style beer -- although on a small scale. Who was drinking beer back then? Most people -- although it wasn't necessarily recognizable as what we think of as beer today. Servants and slaves were given weak beer as part of their daily ration, or as payment, Clark said. Inventory records from the Williamsburg governor's palace show that beer was being brewed on the grounds, and imported beers were being stored there. Home brew went to the servants. Imports were probably reserved for the governor, his family and friends. What did it taste like? 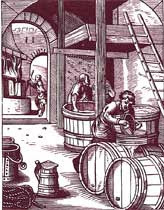 Ale in the 18th century would have, in many cases, contained lots of hops, making it bitter in the same way that India pale ales are today. Hops flavored the brew and acted as a preservative. Moreover, flavors would have varied greatly from batch to batch. Brewers hadn't yet learned about microbes that make beer taste sour or skunky, as beer drinkers say today. "There was a high rate of infection" of the brew, Clark said. "So the same guy would make the same kind of beer, but it would taste different from batch to batch." Modern production makes for uniform tastes, but in the 18th century, beer drinkers expected peaks and valleys in quality. Did they drink beer from glasses? In the early 18th century most beer was consumed through leather, pewter or earthenware mugs or tankards. "You didn't want to put it in a glass because it wasn't very pretty," Clark said. But as the century progressed, lighter, pale ales became more common. The lighter color encouraged thirsty Americans to sip their beer from glasses, not mugs. Did the founding fathers like beer? You betcha. "George Washington was a huge porter fan," Clark said. In fact, when the brew house of his favorite Philadelphia beer maker was destroyed in a fire, Washington had his agents scour the city for the remaining supplies. "Thomas Jefferson favored pale ale or wheat ale," Clark said. Who was doing the brewing? Most often, brewing was a household task. Although commercial breweries existed in Virginia in the 1700s, the majority of the beer consumed was probably homemade. Clark has found no evidence of commercial brewing taking place in Williamsburg in the 1770s, but he knows that beer was being made on the campus of the College of William and Mary as well as nearby on College Creek. What ingredients did colonial brewers use? Some recipes aren't so different from those used today. Raw materials for beer are timeless: grain, water, hops and yeast. Because malted barley -- the preferred grain for most beer makers -- was hard to come by in colonial Virginia, brewers made do with whatever they could find: pumpkin, molasses, even spruce and pine. Come to think of it, my water has been tasting a little funny. I might have to play it safe and have a beer tonight. Good Blog Young Bowers... a good follow on from the banning of Church ales blog (KMSA 13th Sept 2008 ) It would be good to think people who drank cheap beer back then would be blootered all the time but it was literally like drinking ( american beer ) i mean Water. This is why I prefer beer over water every evening. I didn't realize I was so healthy? As to Sir D of O's offer for my home, you'll have to add a few more zeros to that and make it pounds!